Exploratorium and Musee Mecanique will appeal to museum buffs. Get in touch with nature at Fort Funston National Park and Alcatraz Island. And it doesn't end there: get a taste of the local shopping with Union Square, examine the collection at Cable Car Museum, take your sightseeing to a higher altitude at Twin Peaks, and take in the views from Golden Gate Bridge. For more things to do, where to stay, maps, and tourist information, you can read our San Francisco online driving holiday planner . Newark to San Francisco is an approximately 7.5-hour flight. You can also do a combination of train and flight; or drive. Due to the time zone difference, you'll gain 3 hours traveling from Newark to San Francisco. In July, San Francisco is slightly colder than Newark - with highs of 73°F and lows of 57°F. Wrap up your sightseeing on the 6th (Sat) to allow time to travel to Los Angeles. 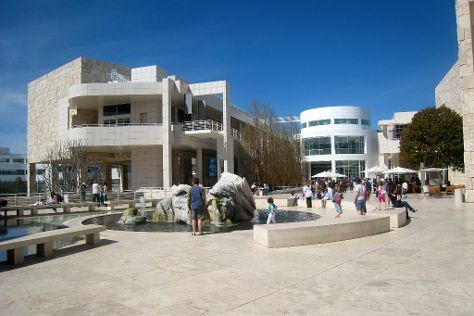 Do some cultural sightseeing at The Getty Center and La Brea Tar Pits and Museum. Head to Montana Avenue and Amoeba Musicfor some retail therapy. There's lots more to do: kick back and relax at Venice Beach and Boardwalk, get to know the fascinating history of Hollywood Walk of Fame, explore the world behind art at Los Angeles County Museum of Art, and look for gifts at Whimsic Alley. To see ratings, where to stay, photos, and other tourist information, use the Los Angeles attractions site . You can do a combination of flight and train from San Francisco to Los Angeles in 4.5 hours. Alternatively, you can do a combination of subway, flight, and train; or drive. Traveling from San Francisco in July, things will get a bit warmer in Los Angeles: highs are around 83°F and lows about 66°F. Finish up your sightseeing early on the 9th (Tue) so you can travel to Phoenix. Phoenix is the capital and most populous city of the U.S. On the 10th (Wed), identify plant and animal life at Desert Botanical Garden and then examine the collection at Musical Instrument Museum. For photos, where to stay, more things to do, and tourist information, read our Phoenix day trip planner. You can fly from Los Angeles to Phoenix in 4 hours. Alternatively, you can fly; or drive. The time zone difference moving from Pacific Standard Time (PST) to Mountain Standard Time (MST) is 1 hour. When traveling from Los Angeles in July, plan for much warmer days and somewhat warmer nights in Phoenix: temperatures range from 106°F by day to 85°F at night. Finish up your sightseeing early on the 10th (Wed) so you can travel to Colorado Springs. On the 11th (Thu), have some family-friendly fun at Battlefield Colorado, then identify plant and animal life at North Cheyenne Canon Park and Starsmore Discovery Center, and then take in the dramatic natural features at Garden of the Gods. To see ratings and other tourist information, use the Colorado Springs trip planner . Fly from Phoenix to Colorado Springs in 4 hours. Alternatively, you can do a combination of flight and bus; or drive. Traveling from Phoenix in July, expect Colorado Springs to be colder, temps between 86°F and 58°F. Wrap up your sightseeing on the 11th (Thu) to allow time to travel to Santa Fe. On the 12th (Fri), pause for some serene contemplation at The Cathedral Basilica of St. Francis of Assisi and then wander the streets of Canyon Road. To see maps, where to stay, traveler tips, and more tourist information, read our Santa Fe online attractions planner . Traveling by flight from Colorado Springs to Santa Fe takes 4 hours. Alternatively, you can do a combination of shuttle and flight; or drive. In July, plan for daily highs up to 88°F, and evening lows to 60°F. Wrap up your sightseeing by early afternoon on the 12th (Fri) to allow enough time to travel back home.